Adnan "DJ A-One" Originally from Morocco, has been living in Abu Dhabi. When he started mixing his first r&b mixtape. 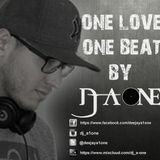 DJ A-One&apos;s passion has always been about his music, which you can hear in his mix-tapes. A-One focuses mainly on Urban, R&B,Hip Hop music as well as Reggae & Trap beats. A-One base for his music in in the UAE, but he also took over International and has spread his vibes over Indonesia, Singapore, Qatar and Morocco….